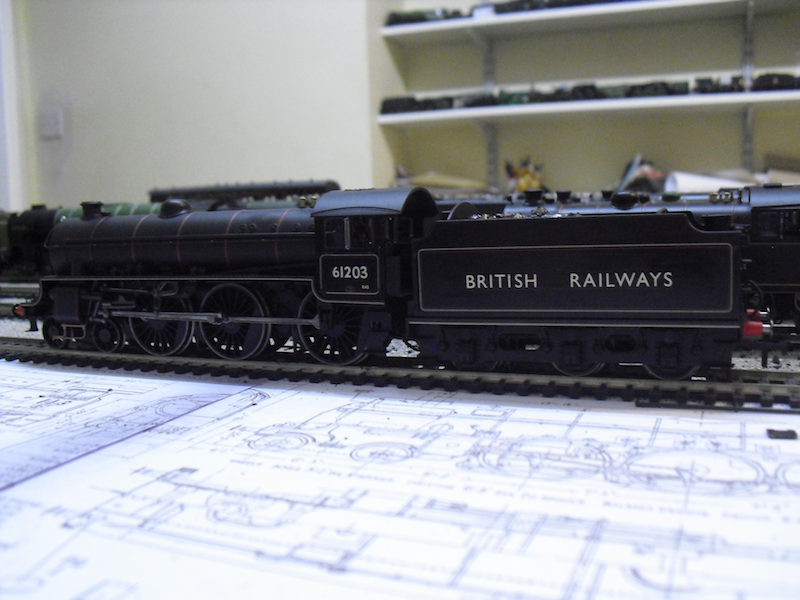 THE BRITISH RAILWAY STORIES LTD: "Hornby B1: repairs and renumbering"
It's not often that I get my head turned by a cheap as chips model. Okay, that's a total lie: I am constantly having my head turned by cheap as chips models, and this is one of them. 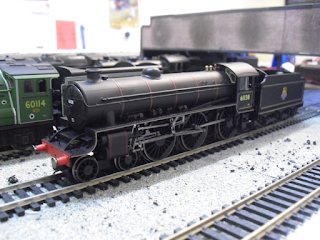 I bought a pair of Hornby B1s on eBay recently, one significantly cheaper than the other (damage to the front buffers and valve gear) and both in fact were a model of 61138. The first thing I did to the cheaper one with damage, was to fit new buffers (from Peter's Spares on eBay) to replace the damaged ones, and a new set of valve gear (bought from another eBayer). The result was an as new model which ran beautifully. The next stage was to renumber and rebrand the locomotive. I used Fox Transfers numerals and lettering for this job, taking care to make sure that both the number and combination of BRITISH RAILWAYS on the tender was historically correct. In fact, there is a photograph of North British Locomotive Company built no.61203 running with a semi-fast train to King's Cross in December of 1949. This photograph can be found in the book The Power of the B1s and is the first photograph in the "Great Northern" section of photographs. 61203 is however extremely dirty and workstained in this photograph, and I intend to weather the model as per the photograph at a later date. 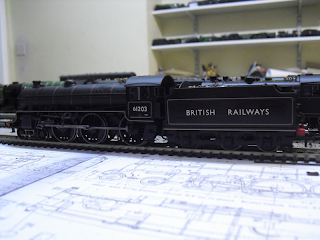 The original Hornby numerals and cycling lion emblem were removed using a mix of a screwdriver carefully dragged across them, and a cotton bud with Revell's colour mix lightly appled. Johnson's Klear was applied to the tender and to the cabside before the waterslide transfers were applied, and once applied and dried using kitchen paper, the numerals and lettering were sealed using Johnson's Klear once more. The front numberplate was made up from single numerals off a Fox Transfers sheet, and the single lamp on the upper smokebox door bracket is a Springside LNER type white lamp. You may also notice that the smokebox door has gained a footstep! This is a resin casting I made earlier this week for this precise detail. Some B1s had it, some didn't. 61203 needed it, and now has it. Overall I'm happy with the renumbering and rebranding. I can say categorically that whilst it is a very fine model indeed, I wouldn't necessarily have bought these over the Bachmann B1 if they had not been at these very reasonable (some might say ludicrous!) prices. The fact is that I should have been more aware of just how fine these Hornby B1s are. 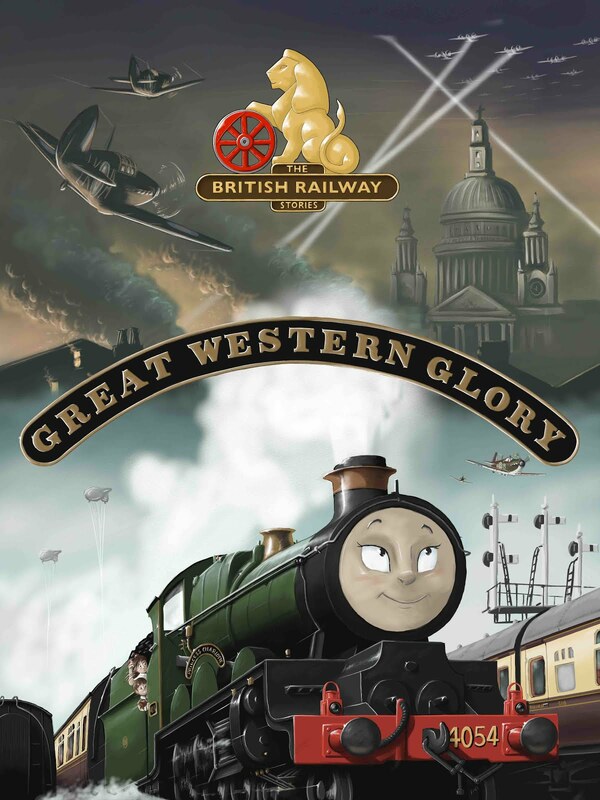 I am mesmerized by the rivet detail on the chimney and the detail of the valve gear. Obviously there are certain Hornby traits I am not fond of (such as the plastic wheel inserts in the bright metal rims) but these can be dealt with very quickly. 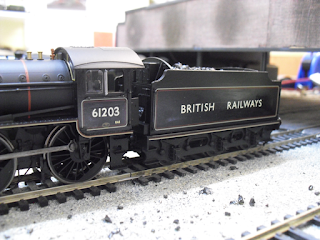 Overall, the Hornby B1 is a fantastic model, right up there with the best of them. For my money, the Thompson L1 is still Hornby's finest steam locomotive model they have ever produced, but the B1 comes pretty close. 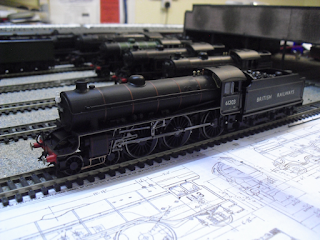 Let's see if I am still saying that in an hour's time, as I unbox Hornby's latest B17/1 model, Sandringham!